This coming Saturday, April 30, 2016 is National Prescription Drug Take-Back Day. National Prescription Drug Take-Back Day is sponsored by the United States Drug Enforcement Administration (DEA). It aims to provide a safe, convenient, and responsible means of disposing of prescription drugs, while also educating the general public about the potential for abuse of medications. 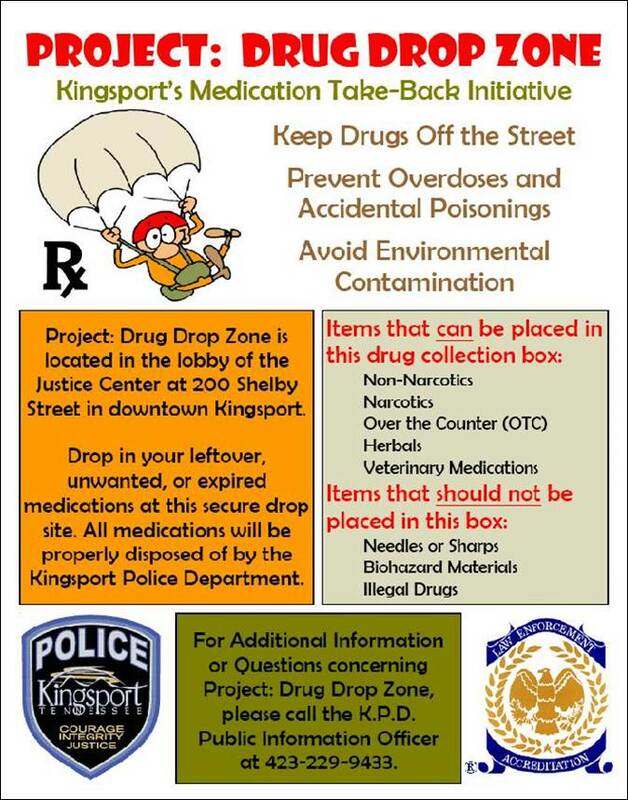 In reality, at the Kingsport Police Department, every day is Prescription Drug Take-Back Day. K.P.D. held their first prescription drug take-back event in 2010, collecting 179 pounds of medications in just a few hours. In 2012 a permanent drop box, dubbed “Project Drug Drop Zone,” was installed in the lobby of the Justice Center, conveniently located at 200 Shelby Street in Downtown Kingsport. This box is accessible to the public 24 hours-a-day, 365 days-a-year. To date, the Kingsport Police Department has collected and incinerated over 6,546 pounds (over 3 ¼ tons) of leftover, unwanted, or expired medications. The goals of this initiative are to keep drugs off of the street, prevent overdoses and accidental poisonings, and avoid environmental contamination. Items that can be placed in the box include non-narcotics, narcotics, over-the-counter (OTC) medications, herbals and vitamins, and veterinary medications. Items that should not be placed in the box include needles or sharps, biohazard materials, and illegal drugs. A map has been included with this release showing the locations of every prescription drug collection site across the State of Tennessee.